oooh, NOW it’s socially acceptable | you seem nice. it’s byob, because i can’t have younginz gettin crunk up in hrrr. everything is colorful and shiny. christmas lights are the only lights accepted unless…no, there’s no unless. oh! and there’s a game of white elephant hip-happenin ’round the massive christmas tree and roaring fire. welcome to the party in my brain. needless to say, i’m freakin pumped about this month. –hey! there’s no singing in the north pole! umm…oh! back to my experiment after that awesome detour. so i proposed this thing on tumblr you see. and i was like hey, what if i do an act of kindness per day leading up to christmas but, like, on steroids. so 1 act today, 2 tomorrow, 3 the next, and on and on and on. but as i was reflecting upon this idea in class, because our guest professor was discussing incontinence (seriously. that’s not a joke) i thought that i was basically challenging myself to be a decent person. not saying that it’s impossible or anything…or that i’m a horrible person by nature, but why would i count “nice” things as being the special of the day. instead, it should be trying to be nice errday. know’m sayin? AND i wouldn’t even know what would count as a good deed. holding a door open for the stranger walking behind you as you enter into a building? that should just be common courtesy, yo. i may or may not be over-thinking this. ALSO, last year i did a 12 weeks of christmas that began in october. this year i’m thinking of just posting something christmas related on my tumblr account everyday instead of blogging on hrr every day. here’s my tumblr if you wanna keep up. let’s face it, you kinda sorta want to. i’ll post them to twitter, too. so yeah, i went to my last class of the semester. what’s left? 3 papers. all due next week. have i started? ish. i’ve ishly started. i’m not too worried about it…for now. anywho, i was just excited to be in december: the month, the mindset, the christmas. be careful in the malls/shops, there be some shady folks out there. ← why aren’t there more popular thanksgiving songs? You is for sure crazy. Perhaps some bangs are in order? Also, Imma hold you to being nice for the month of December…cuz I don’t think it’s happenin….just saying. Also, I’m more flexible than you. 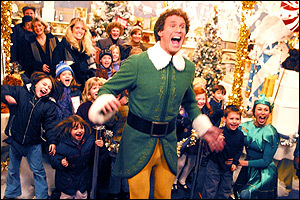 Also, You should’ve just sang the song from Elf when Buddy first gets to New york and there is some mumbling. 1. i’m not getting bangs. YOU should get bangs! 2. I CAN BE NICE, rude. 4a. do you mean the song ‘pennies from heaven’ by louis prima? cause that’s my jam, too. i know all the words. 4b. i don’t know what you’re talking about with the “mumbling.” like when he scats in the song? shoo-bie doo-bie! now i have that song stuck in my head. oooh, now i remember the mumbling…it goes here. mah bad.